Ive had a pretty fun Halloween this year even though the most fun was when my girl was little. Now that shes grown, it just takes the fun out of it. Me and my Husband usually dont celebrate Halloween. 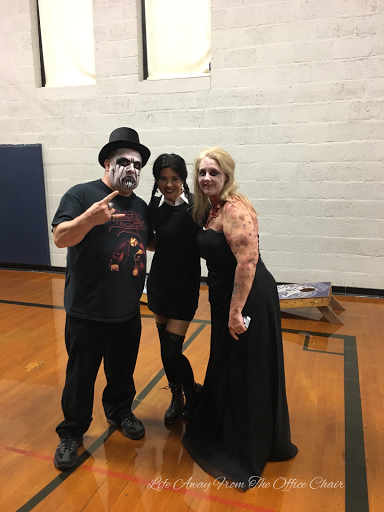 Until this year, the last Halloween party we attened was a church fall festival, probably fifteen years ago. 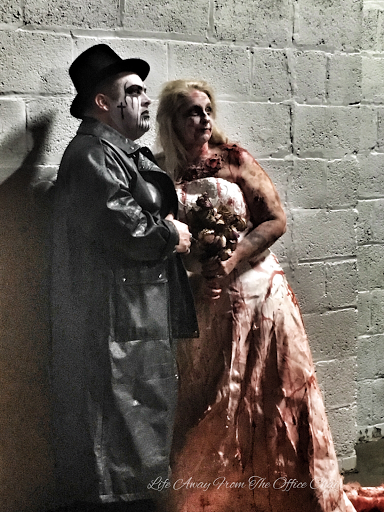 This year we were invited by our neighbors to their "Hallowedding". It was definately a different kind of wedding. But first, my costume reveal. If you follow me on facebook or Twitter, you've probably already seen it. You guys had some good guesses at my costume. BJ was the closest. She was just one TV channel away from guessing. Go check out her blog. You will fall in love with her. Are you ready to see who I am? Back to the wedding. Everyone came dressed up. There were clowns, super heros, draculas and witches to name a few. There was dancing and lots of food. The wedding was held in my old Middleschool gym. Cramerton Jr. High is also where the bride and groom attended. They chose this place because its where they met many years ago and fell in love. Though both went their seperate ways, married and had went on with life. They reunited a couple years ago and realized they still loved each other. Some love story huh?. Here is the photo of the Mr. and Mrs.
We had good time. Nick dressed tacky for the wedding and fit right in. 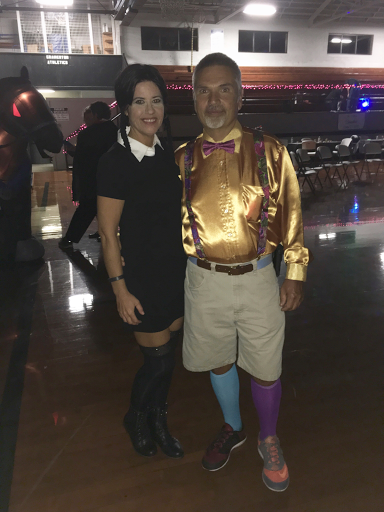 I was excited that he went all out for this halloween shin dig. Like I said before, this is out of our comfort zone. While standing in the food line, they played the Addams Family song and everyone turned and looked at me. With a serious face, I did the finger snaps on cue....hahaha, its all I had. Here we are together. The black lipstick was gone after I ate and forgot to bring the tube in with me. Shucks! 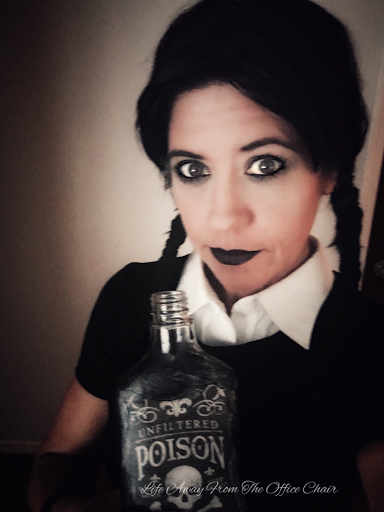 It made up thirty percent of my costume. Me with the bride and groom. I saw a few people I went to the Jr. high school with. The old gym brought back a lot of memories. From the smell of the polyurethane on the floors to the old cold brick walls. The school was closed down a few years ago and turned into apartments. A new Cramerton middle school has been built in new location. I have to go to work today but no costume. Ha. Later on, me and Nick will probably go out to dinner. We do not plan to hand out candy. Not many on our street open their doors for trick or treaters. We stopped handing out candy when the kids started comming in car loads from other neighborhoods, without costumes and holding pillowcases. Even the parents would ask for candy. However, I did make these treats for the neighbor kids. Chocolate covered pretzel sticks. I still have to add the finishing touches to the wrapping and they will be ready. Hope everyone has a spooktacular day! An excellent costume. Happy Halloween. 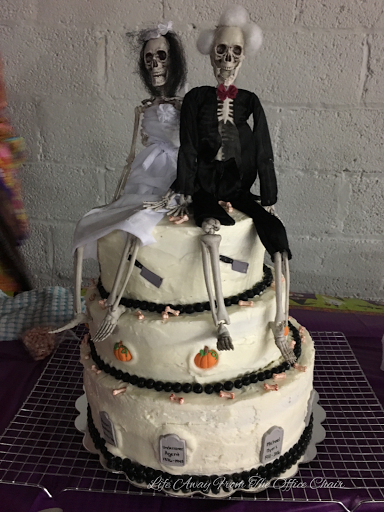 Love the bride and groom (and their cake) too. You are ADORABLE (and may not need to lose any more weight...you are so TINY...You did a great job on your costumes...and your hubby is so cute, too. When I got up this morning, I told my hubby, THE ADAMS FAMILY...he said WHAT ?? ?...Lisa might be going as someone in the Adams family...he said,who's Lisa and I said my blogging buddy and he rolled his eyes so far back, I don't know if he'll ever see again...hahhaa....you did so good. Oh my gosh! I would have never guessed! 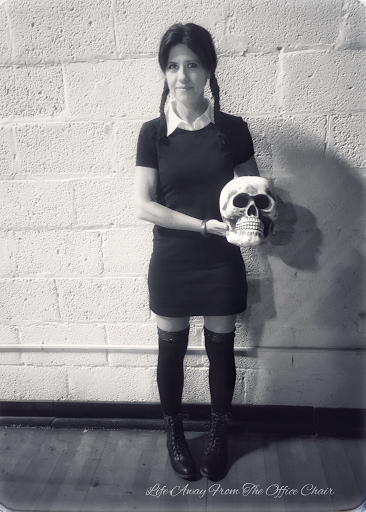 But now that I see you dressed as her, it's brilliant. I used to love to watch The Adams Family. Oh that was a great costume. You look great!! Any idea why they chose that kind of wedding!? We didn't do any thing for Halloween. You and Nick 'Done good'. I like it. 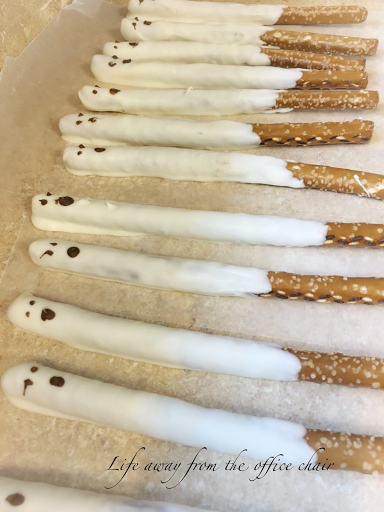 the pretzels are very good, great idea! YOu B very creative (and look good too)! What fun! I love you costumes.